D og people spend a lot of time thinking about how dogs learn, but not so much about how people learn. Given all the complexity in the ways the human brain operates, one might ask, when evaluating any one of the various sources of training information out there, Does it teach people to think and act in ways that work out well for dogs? By this standard, Dennis Voigt’s Training Retrievers Alone will be good for both people and dogs, and it will a valuable addition to any trainer’s library. Dennis is a good teacher – especially, in my view, in the well-written and illustrated manual, and in those sections of the video where he demonstrates a drill, or when he speaks to us, as it were, person to person. It seems to me that the big secret about this work is that it actually isn’t only for those who train alone. We know (from “Retrievers ONLINE”) that Dennis likes teaching and communicating with people as well as dogs. 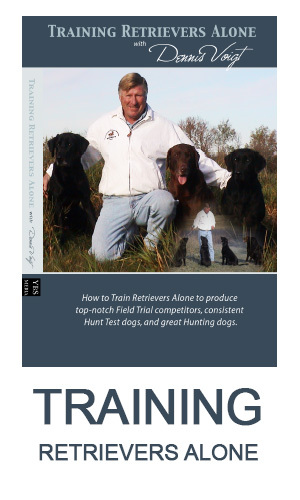 He’s obviously built up a great deal of expertise about training alone over the years, but in the course of making a video and book about this rather specialized situation, he seems to have included almost everything else he’s been thinking about retriever training. The end result will be interesting and energizing to the amateur trainer. It will be most useful for those who are already familiar with the basics of good retriever training through at least the transition level. 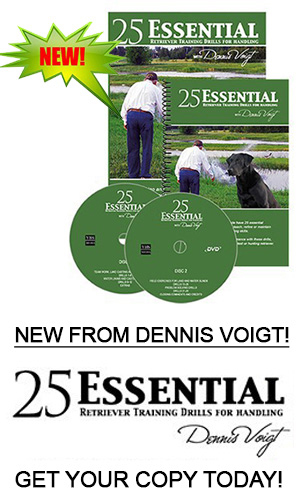 The DVD and video do a good job of demonstrating how the same fundamentals form the foundation for different goals: training for field trials, for hunt tests, and for actual upland and waterfowl hunting. As far as logistics and methodology go, this work offers much valuable information about techniques, setups, and equipment. In the area of very useful technical advice, Dennis’s explanation of how to throw marks by yourself – stand-alone marks, walk-back marks and send-back marks – and how to combine them with blinds planted along the way, seems to me worth the price of admission. The section on efficient setups, as well as 3-peat marks and blinds, is invaluable. I also greatly admire the section on problem solving and what he calls ‘teamwork drills’ – work on the attitude that we instill in our dogs early on and return to throughout their working lives, to encourage them to be team players and trustworthy partners. I find the methods explained and demonstrated in these sections interesting, even inspiring. They reveal possibilities that I hadn’t thought of, and I expect to return to them again and again. Dennis devotes much time and space to the use of mechanical devices. In reviewing these sections, I must confess that my own incompetence with machinery, as well as my limited budget, will keep me from putting this part of his advice to use in my training life. Like many people I know, I have a winger (as well as a collection of outmoded wingers I’d love to get rid of) and I find it very useful for training alone, especially with key relationship drills, diversion birds, and poison birds. So I’m very fond of my winger. However, I can’t imagine ever owning enough mechanical and electronic equipment to set up big field trial triples or quads, with automatically retiring guns, nor the 4-wheeler I’d need in order to put all this equipment in place. I’m sure there are plenty of people who will find this information useful, but it doesn’t really apply to me. Never mind. Any instructional video/book inevitably contains some information that’s applicable to one person and not to another. If you use mechanical devices, you’ll like this section and will want more. Even if you don’t foresee using devices for big setups because you do that part of your work in a training group, you can still do important training on marking concepts alone, and this is an excellent source of ideas for how to go about it. The important thing about “Training Retrievers Alone” is that in some sense, all amateurs train alone. Even when we’re lucky enough to have a good training group, we’re still alone in many ways, because ultimately the responsibility for our dogs is ours and no one else’s. It’s up to each of us alone keep learning, to critique what we do, and keep improving our training. It’s up to each of us alone to resist the temptation to test instead of train, and not to fall into the trap of regarding a training setup as a competition. It’s up to each of us alone to decide on and enforce a high standard of behavior – in our dogs and in ourselves. It’s up to each of us alone to devise good training setups, or to decide how best to run someone else’s series in a way that’s tailored to the needs of our own dogs. It’s up to each of us alone to evaluate our dog’s work and to know how and when to correct and to praise with justice. It’s up to each of us alone to – as Voigt says, ‘assume the guilt’ – to have the humility and strength of mind to realize that our own mistakes have caused confusion or lack of progress in our dogs. When we train alone, if we’re willing to do the hard work involved, we get to develop these ways of thinking as well as training our dogs. Dennis maintains that training alone may well give the trainer more time and space, away from group pressure, to pay attention to what’s really important. If the trainer adheres to high standards in his or her thinking and techniques, and makes high standards of behavior habitual in the dog, then both dog and handler will be better able to stay on an even keel in a group training situation, as well as in competition or in the field. Training alone gives us the time and mental space to get our training right. In this regard, the yard work demonstrated in the video was particularly interesting to me. Arguably, we should return to the yard to address particular problems in a calmer, more repetitive teaching atmosphere than work in the field permits. The amateur trainer who has the advantage of training alone is perfectly situated to attend to these issues when they arise. For example, in one of the Bonus sections, Dennis uses the wagon wheel drill as a vehicle for reinforcing good sits at heel, correct alignment, accurate movement with the handler, and proper delivery. He works, here, with a young dog, but using this drill to refine these behaviors can be beneficial for any dog when the need arises. The wagon wheel is old hat to most trainers, but the way it’s employed here may not be so familiar, and it’s good to watch it being used for a different purpose, and with such responsive patience. Anyone training alone can apply Dennis’s suggestions for incorporating stimulating elements (such as holding blinds, birds, shots, and some devious tricks with radios) into daily solo training sessions, so that the dog becomes accustomed to them. He acknowledges, however, that especially for a field trial or hunt test dog, training alone has to be varied or alternated with group training. He does so himself, according to the season. Dennis can’t solve all of the amateur trainer’s problems. He can’t, for example, provide each of us with the enviable training grounds on display in the video! He recognizes the challenges that the solo trainer experiences, but he is persuasive in arguing that training alone, done right, offers huge rewards for both trainers and dogs. This point of view provides an excellent counterweight to the assumption that training alone is inevitably a hardship. Indeed, he shows that training alone can actually provide unique benefits, and they can be profound ones. If the trainer takes the time to think carefully about what he or she is doing, and meticulously plans and evaluates both his/her work and the dog’s work, the dog may actually learn more while training alone than in more conventional settings. Clearly, we can’t do all of our training alone; we do need other people. But when you do train alone, it’s good to be aware of how positive and effective it can be. Done mindfully and with good methods, training alone can actually teach both dogs and people a great deal that they might not otherwise learn so easily or so well. Then too - besides all the other advantages – you get to be alone with your dogs. You get to think things over. You get to make haste slowly. And, as Dennis suggests, you may even benefit from taking the time to smell the roses.